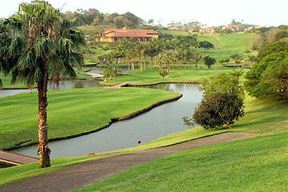 Located in a conservation area, San Lameer Golf Course provides a great game of golf amidst natural wildlife, including hundreds of bird species and buck. This is a parkland 18-hole course, designed by Peter Malkovich and Dale Hayes. The course may be challenging, but fun to play. Facilities include a pro shop, half-way house restaurant, and bar lounge. Beautifully maintained and very well organized. Sanlameer Golf Course is 2.6km from the centre of Southbroom , the nearest airport 10.5km (Margate Airport).